We really enjoyed playing a group poetry writing game this week. I got the idea from this wonderful teacher and tweaked it so it would work for us. I thought our "group" of three might be too small, but it wasn't. I chose four subjects - two photos from books, one photo hanging in my room, and a musical instrument - and gave each of us strips of paper with numbers that corresponded to each item. Then we spread out and spent time writing words about the pieces. My request was that we shoot for having at least one noun, one verb and one adjective. Then we folded the pieces of paper up and shifted to a new object. When we were all finished, we each chose one of the objects by number. Ani chose number two, and we gave all of the number two strips to her. It was her task, then, to put the words together - some or all of them - into a poem about the object. poem for #2, titled "Wooden Music"
Eliza's poem for #4: Fancy sisters, content & happy. Ani's poem: Big Fish. Daddy fishing. Heavy fish. Proud, grinning Daddy!! Eliza's poem (using the same group of words): Proud, huge grin, bloody and heavy. Great fun for our first go at it! We will definitely do this again, and next time I think we would talk about looking at art first, finding ways to connect to something deeper in the image. I loved that there was some freedom in leaving words out or repeating words as it worked for the sound of the poem, and I was happy that Ani chose the instrument. She is so sound-focused and she explored the whole piece and not just the way it looked. Noisy! Noisy! Clack! Clack! Clack! There is also room to explore rearranging words for different effect, or altering the punctuation. We've had quite an immersion into poetry this late winter, with weekly poetry teas together, and a weekly writer's group with a beloved local poet, Wendy McVicker. Both beg their own posts, but I think some of the enthusiasm for this game was generated by a growing love for and comfort with word crafting. One evening found us back at the Austrian Hospice in the old city of Jerusalem, sitting at table with Dalia Landau, who lead us through a Shabbat Seder - a ceremony that welcomes the Queen, or the feminine divine through song and prayer. Dalia is the subject of The Lemon Tree by Sandy Tolan, which tells the story of her discovery that her adopted family home, in Ramle, Israel, was the family home of Palestinians who were forced out in 1948. Her family were Jews who fled to Israel from Bulgaria. As a teenager, she met the boy who grew up in that house, and their families have together turned it into a peace education center for Jews and Muslims, called the Open House Center. This Seder was one of the most moving moments of this trip for me (and with all we saw that is saying a lot!). We had heard so much about politics and dividing lines, that to sit in prayer and ceremony together felt like peeling away the machine guns and surveillance cameras, the wall, the barbed wire, and getting back to something living and divine. We washed each others' hands, sang together, broke bread and drank wine, doing our Midwestern best to sing the beautiful Hebrew prayers. It was part ceremony and part theology. Dalia talked about the Torah as being both a book and the discussion that continues, not something to be taken literally; a text to be held up to constant interpretation. As we finished our evening with tea and apfel strudel, Dalia encouraged us to confront our prejudices and keep open hearts and minds. If you are pro-something, you are against the other side. If you cannot contain both sides in your heart, you are a part of the oppression. But she worried it like a hidden splinter. I would observe her through the day every week, in her classes and at lunch, having a great time, enjoying the company of her friends and loving having babies around to entertain and help with. Then without fail at some point in the week she would declare that she was done with coop and would not be returning. Somehow the next Tuesday would roll around and we'd make it there, only to repeat the declaration with more vehemence. Finally she said, I know what I'm going to do for my presentation! Ah, that's what's going on. She said, "When the teacher turns to me to say, Ani do you have something to tell us about Russia? I am just going to answer her: NO!" She was very happy to have come up with this simple and honest way out of the deal. I asked her if this is what she was thinking about whenever she felt frustrated about returning to coop....duh, yes. So, we talked about options. The other kids were choosing poster boards and facts, but that was not for her. (And let me just say that she was not the only one with this anxiety. One of the other moms said her daughter was up all night the night before her presentation and the mom had to translate her whispers to the class, she was so nervous. We would have quit before then, I think...) I finally convinced her that she could really think out of the box on this one, and do something that would be fun for her, because if she was enjoying it, chances were the other kids in the class would enjoy it too. She is clearly a little Russian girl named "Too Nice Child", out on a scary adventure to Baba Yaga's chicken hut in the woods, with her bonnet and apron and her magical helper doll tucked in her pocket. She was out there for at least an hour, then in to change clothes, and back out again, talking and figuring and acting out her story. I was so grateful that we had the time for her to play through her worries and find herself into a comfort zone that allowed her to meet the expectations of her class and teacher on her terms. Do you remember the anxiety of performing in front of your teacher and a class of students? Oh man, I do. I feel like I always got through it fine, did well, and felt like I had accomplished something, but the worrying ahead of time was sometimes paralyzing. It was as if once Ani had figured out her plan, the worry was all gone, and she felt confident and relaxed. She showed the class how to write her name in the cyrillic alphabet. She taught them how to say yes and no in Russian. She showed them a few things we have from home that are Russian, and showed them where it is on the globe, explaining that it is a part of Europe and Asia. Then, while they ate their borscht (yes, they all tried it, and no one was rude! ), she read her story, stopping at the end of every page to show the illustration. Last week was spring break around here. Ha! Which meant snow, of course, and more Busy for Dan (there was a conference to prepare for), and some much-needed time with friends who were also on break. The week started with making paste-paint papers (which we did last year at about this time! ), using the big well-lit studio on campus. Fancy! Mid-week Dan and I got out on a date to see Bela Fleck and Abigail Washburn at Stuart's Opera House. Oh wow. We've been going to see Bela for 20 years, starting in a highschool auditorium in Wisconsin, so we knew to expect something amazing from him, but I'd never heard of Abigail, and she was this incredibly dynamic and powerful performer who played off of his straight-man act well, and blew the audience away by singing more than a couple songs in Chinese (she talks about her connections to China on this TED Talk. She may be my new hero). It was wonderful. Ok, let me slip in this picture of my gorgeous daughter and her new 'do. Gasp. We finished the week with colds (dangit), and a hike without coats. Yeah, that's right. Take that, winter. We didn't have a lot of stamina, but it felt so good to slosh through the mud and smell the woods and see so much green starting to peek out. M and N check out the cave. Still icy and so dark. I smell you, Spring. I do. home / school / life magazine and a give-away! When we were expecting Eliza, I had known exactly one person who had been homeschooled, one incredibly creative, motivated, well-read, confident homeschool graduate. She made it look good! We then met a family in our birthing class who was homeschooling their four-year-old and they influenced us in a myriad of ways: baby-wearing, co-sleeping, attachment parenting, cob house construction, livingroom concert hosting...wow, that is quite the list, but they were beautiful, compassionate and smart people and what they were doing made a lot of sense, so I guess I can say that we started considering homeschooling our kids with the birth of our first. That was almost twelve (gulp) years ago, and I can still talk for hours about homeschooling. What we're doing, what we're not doing, what you're doing, what's happening in the community, what I'm worried about, what I'm so excited about...it's endless. Of course I have other interests, but this is basically my job right now, so I'm a bit consumed. 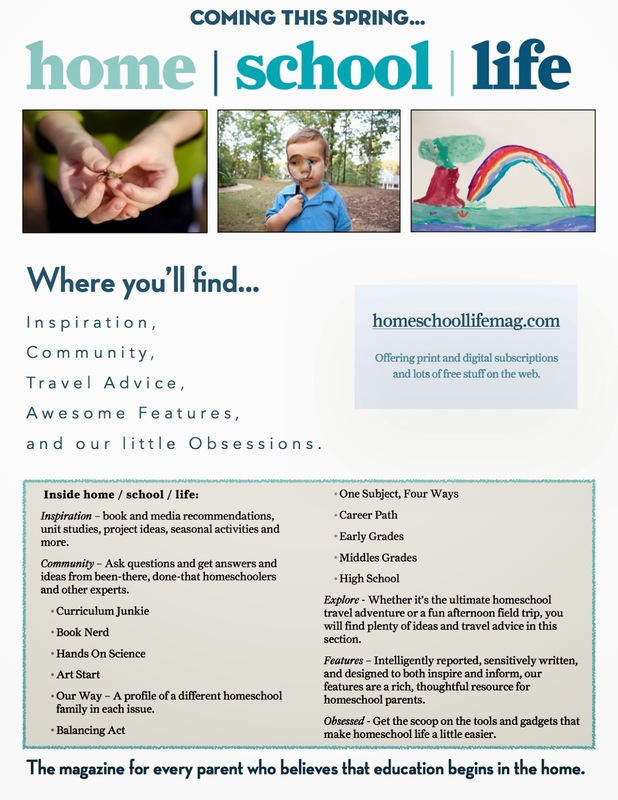 Luckily for me, there are other homeschoolers who love to talk and blog about homeschooling just as much, and this spring there is a new resource being born for those of us who can't get enough: home / school / life magazine! In their words, they aim to be "as creative, playful, and informed as the best homeschool days. " Well, that sounds pretty good! In anticipation of their launching, editor Shelli Pablis of the blog Mama of Letters has generously offered me one free year-long digital subscription to give away! To enter, leave a comment and we'll pull the winner's name out of the hat on March 14. Tweedle Dee and Tweedle Dum, all in one person. The kids were so pleased with every aspect of this event, and it was lovely to see them working together on the costumes and the fun. They are so incredibly creative! Osha created the treasure hunt, and my favorite part was that he included a second layer of clues which were then used to unlock a computer program that revealed another clue. An awesome way to weave his primary love - computer programming - into a present for his friend. Good feelings all 'round, Dan and I got in a date (a date!) and the girls came home haaaaaaappy this morning. And it's snowing! Happy March!